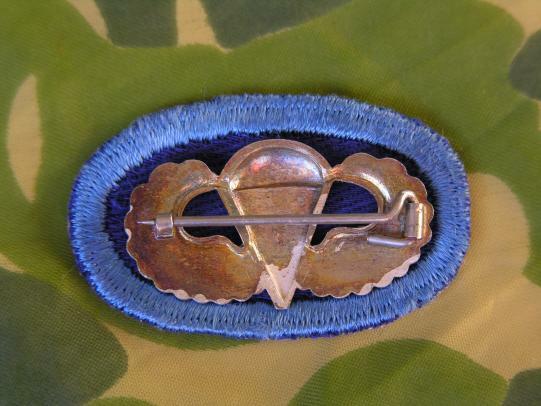 A good Glider trooper garrison cap badge in near mint condition. A fully embroidered one piece patch, mint condition. Measures 3 7/8" x 2 3/8"
The division arrived in France, it came under the command of the First Allied Airborne Army, which controlled all Allied airborne formations. The division, along with two others, was selected to participate in Operation Varsity, the airborne operation to support the Anglo-Canadian 21st Army Group crossing the River Rhine, but was removed from the operation due to there being insufficient transport aircraft to carry all three divisions into combat. Here is a scarce 101st Airborne 502nd PIR Oval embroidered on twill material and a cheese cloth back with an English made (no maker marks) pin back jump wing pinned to the oval. Both items are on good condition. 502nd were based at Chilton Foliat in England and jumped into Normandy on D day and fought in Battle of the Bulge, Market Garden and into Germany. Head Quarters 82nd Airborne Para oval embroidered on felt with a cheese cloth back. In good condition. 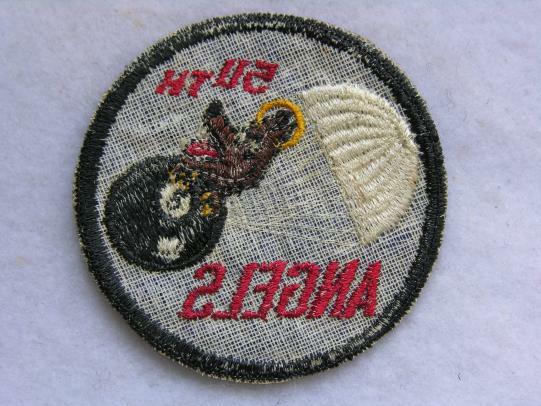 An good period example of 101st Airborne Screaming Eagles patch known as a Bando's type 3. Separate tab and removed from uniform. During World War II, it was renowned for its role in Operation Overlord the D-Day landings and airborne landings on 6 June 1944, in Normandy, France, Operation Market Garden, the liberation of the Netherlands and, perhaps most famously, its action during the Battle of the Bulge around the city of Bastogne, Belgium and The Eagles Nest. An early used and removed from uniform 101st Airborne Division patch. Separate tab some light service wear. During World War II, it was renowned for its role in Operation Overlord the D-Day landings and airborne landings on 6 June 1944, in Normandy, France, Operation Market Garden, the liberation of the Netherlands and, perhaps most famously, its action during the Battle of the Bulge around the city of Bastogne, Belgium. 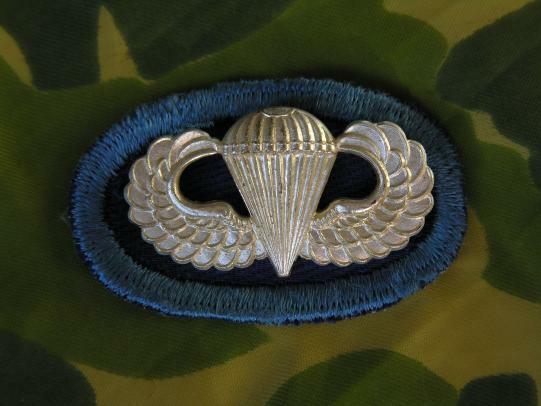 A scarce English made Paratrooper Badge, pin back and maker marked J.R. Gaunt London. Measures 1 1/2" x 9/16"
I have two in stock in as near the same condition. An early occupation period 501 patch fully embroidered on twill with a cheese cloth back. With some service wear and aging. 501st were a division within the 101st Airborne, jumped on D Day Normandy, see action throughout the war Ardennes Battle of the Bulge, Market Garden and on into Germany. Here is an occupation period 511th patch. Fully embroidered in silk thread on twill material on a cheese cloth back. 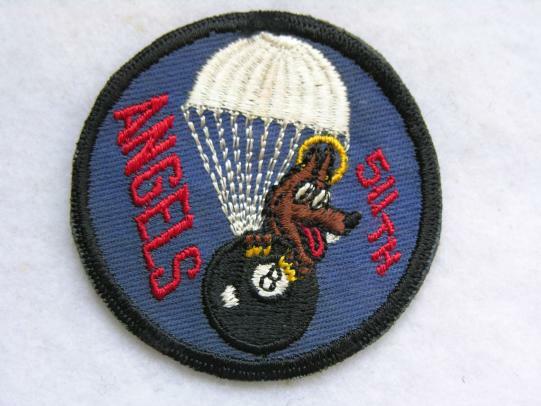 The 511th Parachute Infantry Regiment (511th PIR) was an airborne infantry regiment of the United States Army, first activated during World War II. 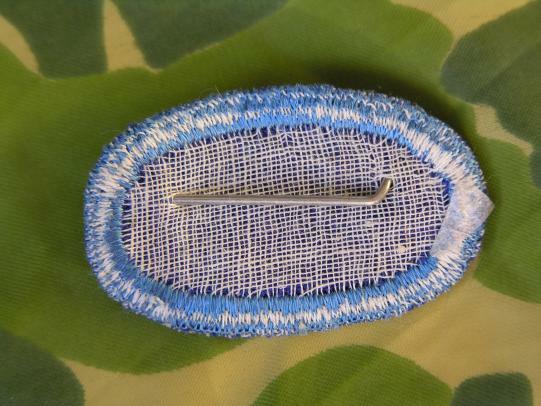 It formed the parachute infantry element of the 11th Airborne Division. Fought in the Pacific Theatre.